Denver, the capital of Colorado, has a reputation of the metropolis that stays on the forefront of the pedicab industry. Pedicabs in the city are licensed and regulated. If you come o Denver, you will see them everywhere: they are coursing through traffic in LoDo, whisking riders to and fro, from Broncos, Rockies, Nuggets and Avalanche games, to conventions and hotels. It does not matter how you call them – pedicabs, trikes, or rickshaws – Denver has a sheer number of eco-friendly taxis. 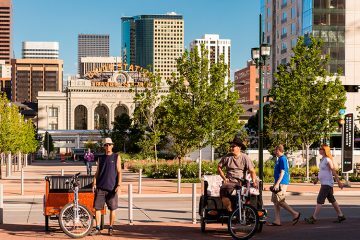 Denver pedicab tours attract both citizens and tourists of the city. Pedicab business in Denver is quite popular. There are several pedicab companies that offer their services, including Main Street Pedi-Cabs, Tadpole Pedicabs, Pcpedicabs, Jay’s Valet Parking, Three Kings Pedicab and Big Tree Pedicab Management. Each company requires their employees work long hours, to be athletic, patient and, for sure, enough lucky to attract more costumers. 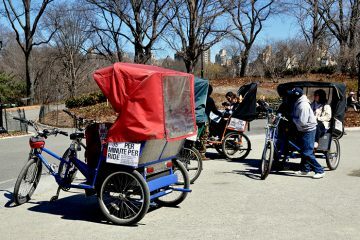 The working day of most pedicabs is a 12-hour day or more. It is not an easy day’s work. Furthermore, working for pedicab company requires having some sales skills. Each of them has its own carny sideshow siren. You can hear them as “Fun rides, folks!,” or “Quick rides, fast rides to the light rail!”, or even “I got seats that vibrate!”. Customers of pedicabs in Denver are varied. These are tourists who are looking for a quick ride back to their hotel, those who come to explore the city of Denver and even marijuana tourists. Citizens see pedicab services as an attractive way to spend some time in the cab on their way back home or as a weekend option to ride to the next bar. Everyone in Denver can find themselves in the cab, whether we are talking about college students, bartenders, investment counselors, doughnut makers, or serial entrepreneurs. Though pedicabs and peddicabers have to be licensed in Denver, the business is really popular. The best thing about it is that you will not need like $100,000 to get into. Buying your own cab, getting insurance and a spot needed for such business will cost you roughly $6,000. Furthermore, more stringent licensing requirements make Denver a safer and more pedicab-friendly city. Pedicabs companies in Denver are also looking for the ancillary business like advertising, event rentals, photographing and tours. It is worth to mention that placing adds to a pedicab is considered to be one of the preferred ways to profit from owning pedicab business. 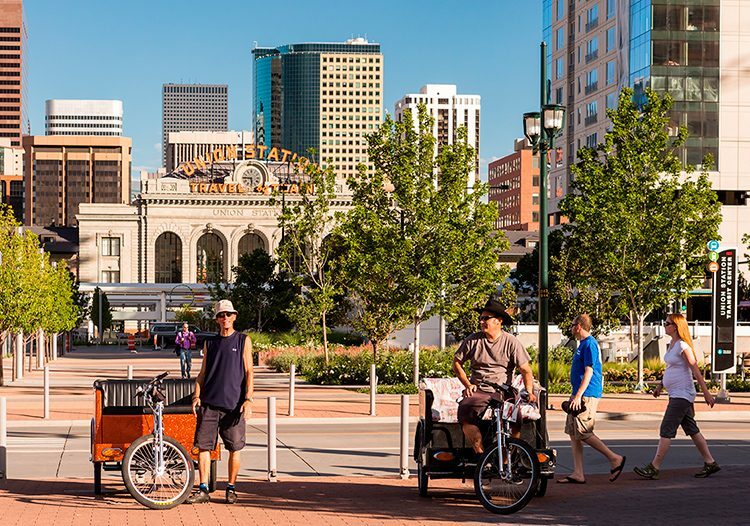 Pedicab services in Denver are offering numerous benefits to the city, its citizens, and visitors. They are considered to be a quick means to get from one place to another, as well as they are considered to be a Colorado way to experience all the breweries and bars that downtown has to offer. Furthermore, drivers of pedicabs are experts on the best places to eat, the most happening bars and the fastest way to get there. So while in Denver, do not miss a chance to explore the city in a pedicab. 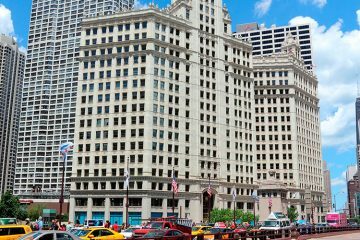 Since the first commercial use of pedicabs in the US in 1962, this eco-friendly mean of transportation has become a popular tourist attraction and a widely used alternative to a classic taxi service in dozens of cities all across the country. The popularity of bike taxi is provided by environmental benefits and, for sure, entertaining part of the ride. In a pedicab, the exploration of any city turns into a real adventure. 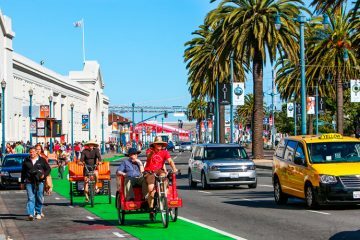 Bike taxi has a lot of advantages, and when it comes to summer periods, there is nothing better than taking a slow ride in a pedicab, enjoying the beauty of this or that city by taking a pedicab tour or just having a fresh air ride. 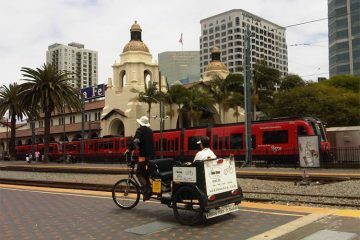 Pedicab services are available in dozens of the US cities. 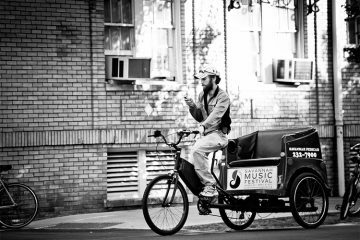 New York, San Diego, New Orleans and Savannah host hundreds of pedicabs each. Today, pedicab businesses are ready to offer wedding and special services, numerous tours across this or that city with licensed guide-drivers, private rentals, advertising and much more. In a pedicab, you can enjoy a special view of city's scenery that will remain in your heart for a long time. 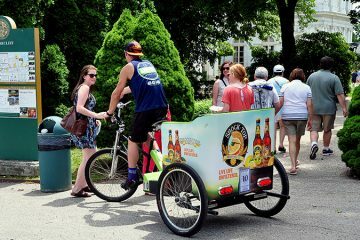 Whether you are a resident or tourist, a pedicab ride is always a good choice to get from A to B with fun and pleasure!